Mercedes-Benz Vans will rely heavily on its alliance with Renault-Nissan to manufacture its new pick-truck that it will sell in Argentina, Brazil, South Africa and Europe from 2017 onwards. Significantly Mercedes-Benz Vans seemingly has decided not to enter the US market at this stage with the truck. Could it be that the sticker price would be too high for this market where it would have to compete with Ford Motor Company, General Motors, Fiat Chrysler Automotive, Nissan and Toyota to name but five? The European market launch of the X-Class will begin in late 2017. The company says the new model series will be positioned in the segment at an attractive price with production for the European, Australian and South African markets set to start at Nissan Motor Iberica’s plant in Barcelona, Spain, in 2017. The Barcelona plant was set up in 1980 with production beginning in 1983. It employs 3,830 people, and recently the plant was awarded production of the all-electric e-NV200 van (what Nissan calls a game changer for its electric vehicle portfolio) as well as the new C-segment Nissan Pulsar. This is now a diversified production facility which previously had been known exclusively for its light commercial vehicles. The Mercedes-Benz Vans’ X-Class for the Latin American market will roll off the assembly lines at the Renault’s plant in Cordoba, Argentina, starting in 2018. The Cordoba plant is quite old – founded in 1955. From the outset it has produced Renault vehicles, starting with Dauphine, under the supervision of Kaiser Argentina. Dauphine was followed by Frégate and Ondine. In 1967, Renault became the majority shareholder with a 70% stake. The entity changed its name to IKA Renault then Renault Argentina SA. Over the years, the plant has built a number of brand models: Renault 4 (1963-1997), Renault 6 (1969-1984), Renault 12 (1970-1994), Renault 18 (1981-1998), Renault Fuego (1982-1995) and Renault 19 (1993-2000). In 2010, Renault invested 135 million Argentine pesos to modernize the Santa Isabel plant, replacing the existing installations with a new single-flow production line. Production is currently focused on Kangoo (PC and LCV), Clio II, Symbol and Fluence. The plant employs about 1,850. With the X-Class, Daimler AG and the Renault-Nissan Alliance claim they are expanding a strategic cooperation that began six years ago. Daimler claims also that this affords Mercedes-Benz a “fast and cost-efficient entrance to the fast-growing segment of mid-size pick-ups”. In addition, both companies claim they can “benefit from optimal utilisation of production capacity”. Nissan claims to be the world’s second-largest manufacturer of mid-size 11-ton pick-up trucks, and looks back on over 80 years of experience in producing and marketing these vehicles. Referring to the Concept X-Class (above), Mercedes-Benz Vans says the first premium pickup will combine the best of two worlds based on two design variants of the concept car. 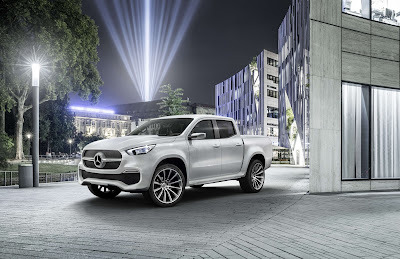 It claims the Concept X-Class “powerful adventurer” illustrates that the future X-Class will possess all the strengths of a classic pickup – tough, functional, strong, and with off-road capability; while the Concept X-Class stylish explorer goes a step further and shows what will distinguish the pickup bearing the Mercedes three-pointed star. With the pickup, Mercedes-Benz Vans is expanding its product range with a fourth model series, while at the same time claiming it is the first premium manufacturer to occupy the “promising segment” of mid-size pickups. To do this it is making an investments in the high nine figures (euros). The top-of-the-line model will be powered by a V6 diesel in combination with 4MATIC permanent all-wheel drive. Clearly, Daimler is providing the powertrain. The all-wheel-drive system will combine an electronic traction system, a transfer case with reduction gear, and two differential locks. The traction system and the electrically operated on-demand differential locks channel the power to where traction is highest. Under extreme off-road conditions, the rear differential and the inter-axle differential can be locked. The ladder-type frame is suitable for a payload of more than 1.1 ton and a towing capacity of up to 3.5 tons. According to Mercedes-Benz Vans, mid-size pick-ups currently have the largest share of the total vehicle market in Australia with 14.1 per cent. Argentina is close behind with 11.6 per cent. Thus in these countries, one out of every eight registered vehicles is a pick-up truck in the one-ton category. In Brazil, mid-size pick-ups have a share of almost five per cent of the total vehicle market. That figure is 0.5 per cent in Germany, 1.3 per cent in Great Britain, 1.4 per cent in Turkey, and 0.8 per cent in Russia. Based on its market research studies, Mercedes-Benz has identified five customer groups for the X-Class, which are of different relevance in the individual countries. One important target group is constituted by families with an active lifestyle and an affinity to premium products. They use the pick-7up mostly for commuting to work, for shopping, school or sports activities, for weekend trips, and vacation. Key markets are Brazil, Argentina, Australia, and South Africa. Another target group for the X-Class are successful adventurers living in an urban environment and participate in outdoor sports such as skiing or riding jet skis, or have their own boat. The top markets are Australia, South Africa, Brazil, Great Britain, and Germany. In addition, Mercedes-Benz Vans says the pick-up will have the potential market for those who lead an independent lifestyle and want a vehicle outside the mainstream that underscores their personality and status with a unique design. Independent individualists use the pickup as an "everyday vehicle" in the city, for evening and weekend activities, and for sporting events. The key markets for this target group are Germany, Great Britain, South Africa, and Brazil. The fourth customer group comprises business owners such as building contractors, architects, and service providers who want to use their pickup for commercial and private purposes. Significant markets for business owners are Germany, Great Britain, Australia, and Argentina. Landowners, such as cattle ranchers in Argentina, soy bean farmers in Brazil or vintners in South Africa, also use their pickup for commercial and private purposes. Let's call a spade a spade. Mercedes is getting involved increasingly in 'badge engineering' of vans. The new pick-up is little more than a Nissan/Renault vehicle adorned with a three-pointed star. It might have slightly more prestigious interior trim which, together with that distinctive badge, will justify a higher asking price the same vehicles offered under the two more mundane brand names. Daimler's collaboration with Renault started a couple of years ago with the Mercedes Citan Van, a rebadged Renault Kangoo. Citan sales in markets outside Germany have been less than sparkling. Then came a revised Vito embodying a Renault powertrain. The question that should be asked is whether the Mercedes marque is being devalued? Messrs Zetsche and Ghosan must have deliberated long and hard on the matter. The answer is that it's probably too early to say. Chickens might come home to roost when these Renault/Nissan engineering Citans, Vitos and X-class pick-ups have been in service for five or more years, to determine whether they live up to Mercedes customer expectations on durability and reliability.